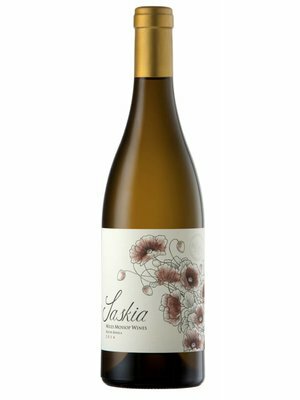 Miles Mossop Wines Saskia 2014 - eWine-Your partner for good wines! Concentrated aromatics abound with white peach, honeysuckle, pineapple and wild vanilla. This dry white wine is a blend of 67% Chenin Blanc, 22% Viognier and 11% Clairette Blanche. The grapes for the Chenin Blanc were sourced from an old, unirrigated bush vine vineyard planted in shale soils in Stellenbosch, and from two old bush vine vineyards planted in granite soils in the Swartland region on the north eastern side of the Paardeberg. The Chenin Blanc in Stellenbosch was picked at around 24° Brix with a bit of botrytis and raisining, which adds complexity and richness to the flavour. The Swartland fruit was picked early in the season to preserve the mineral texture in the grapes. The Viognier was sourced from a vineyard on the southern slopes of the Paardeberg in Paarl, planted in decomposed and colluvium granite soils. The grapes were harvested at around 24° Brix. The Clairette Blanche was sourced from a similar site to the Paardeberg Chenin Blanc and was picked at a very low sugar level (19.5° Brix) to preserve the acidity that is inherently low in this variety. Whole bunches were pressed. The juice was then transferred to 400 litre barrels after minimal settling and the fermentation was allowed to set in naturally. After fermentation, the wine was topped regularly and matured sur-lie for 11 months with regular lees stirring in French Oak, with 18% being new. Barrel maturation After fermentation the wine topped regularly and matured sur-lie for 10 months in French Oak, with regular lees stirring.The 2012 vintage has no new wood just 2nd to 5th fill barrels have been used. After 10 months the wine is racked to tank for blending.